SAN FRANCISCO — The Renaissance Parc 55 Hotel was awash in bright red T-shirts Feb. 15 as over 2,200 hotel workers and their supporters gathered to launch a national campaign for good wages and benefits, including health care, workers’ rights, decent working conditions and dignity on the job. 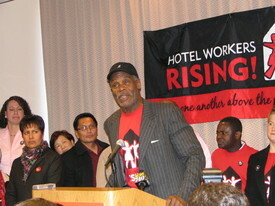 Kicking off “Hotel Workers Rising” and the latest phase of Unite Here Local 2’s contract struggle were the union’s top national leaders, Bruce Raynor and John Wilhelm, together with actor/director Danny Glover, former Sen. John Edwards and Mayor Gavin Newsom. Also on hand were contingents from the United Food and Commercial Workers, SEIU and the United Farm Workers. 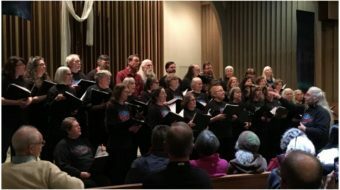 Similar events took place in Los Angeles, Chicago and Boston. In Boston, 600 workers and community supporters from across New England rallied at the Ritz Carlton Hotel. 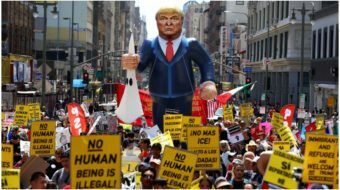 “All change in this country has come about because there has been a public outcry and public dialogue,” Danny Glover told reporters at the San Francisco rally. “These men and women, who come from a variety of communities and nationalities, are simply demanding justice.” Many hotel workers are women and immigrants. Glover spent the week traveling to the four cities along with Edwards and a group of hotel workers. With hotel ownership increasingly held by a few giant corporations, speakers stressed the importance of linking struggles nationwide. Local 2 members from several San Francisco luxury hotels, engaged in a sharp contract battle since 2004, described their daily struggles to cope with growing workloads, including the so-called heavenly beds with their ever-heavier layers of bedding. As workloads soar, they said, so does an injury rate already among the highest for any industry. Some 9,500 San Francisco hotel workers are currently working without a contract, as the struggle continues with over a dozen luxury hotels. Contracts have expired at another 45 area union hotels. Across the country, contracts at over 400 hotels covering 60,000 workers will expire in 2006, providing the opportunity to demand increased benefits nationwide. Dorothy Johnson and Gary Dotterman reported from Boston.